PROVIDENCIALES, Turks and Caicos Islands – The Turks and Caicos Islands Football Association is making moves to secure the future with the extension of the youth program from Providenciales to sister islands Grand Turk, North, Middle Caicos and South Caicos. ST. JOHN’S, Antigua – The Caribbean Football Union (CFU) announces the appointment of Theresa Pitcairn as Administrative Consultant. The Concacaf Women´s Championship 2018 CWC will determine the three Concacaf teams ot the Confederation that automatically qualify for next summer’s 2019 FIFA Women’s World Cup in France, while the fourth-place team will play a playoff against Argentina, third place finisher from Conmebol in a World Cup playoff. Moscow, Russia – The Caribbean Football Union (CFU) held it’s XLI Ordinary Congress on June 11th 2018. The sub CONCACAF body held elections for President and a position for the Executive Committee. 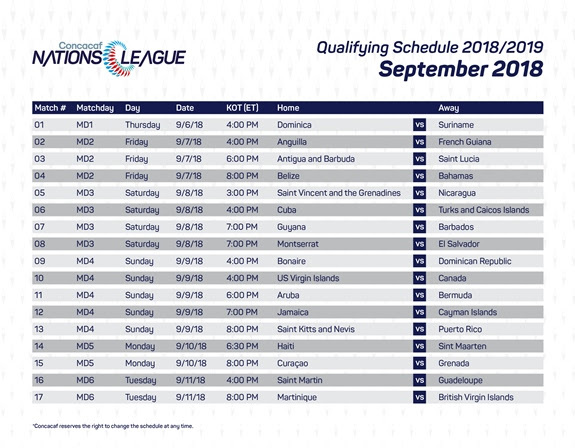 The Confederation of North, Central America and Caribbean Association Football (Concacaf) unveiled today the schedule for the qualifying phase of the Concacaf Nations League. 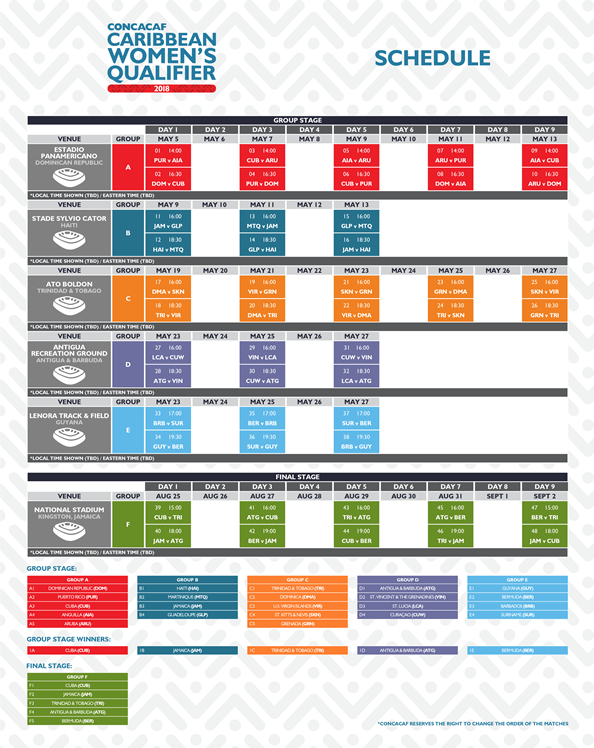 The sixty-eight-match qualifying phase will take place during the four FIFA match windows of September, October and November 2018 and March 2019. CONCACAF President and FIFA Vice President Victor Montagliani will lead a delegation to Grenada to attend the Final of the inaugural Grenada Football Association Pure Grenada Cup taking place at the Kirani James Athletics Stadium on Saturday. St. John’s, Antigua –The Caribbean Football Union’s Women’s Challenge Series saw Groups D and E wrap up an action filled week.